As the Communications and Marketing Intern at The Writer’s Center, I spend most of my time writing social media posts and blog articles, and assisting with editing, emailing, and digital marketing. However, for National Novel Writing Month, I decided to branch out from my regular duties. That’s right; I decided to try my hand at writing 50,000 words in 30 days! 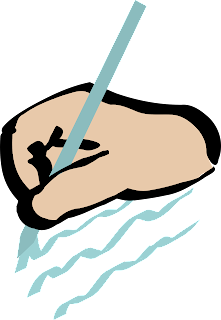 The novel I chose to work on tells the story of a young woman who discovers she has magical powers because she is left-handed. To date, I’ve written a little more than 7000 words, and I think that’s great! But, it became clear to me that I won’t be able write an additional 40,000+ words before the month’s out, so I’m adjusting my original goal accordingly. #NaNoWriMo Lesson #1: be flexible. I decided to try out NaNoWriMo this year because it would be a new experience. Going in, I had an inkling that I wouldn’t be able to reach the magical 50,000 words. I knew that, with my busy lifestyle, the odds were stacked against me. But when it comes to writing, are we really racing to reach a goal? Some of us will pen those 50,000 words by November 30. Some of us won’t. But in the end, we all win. Why? Because we wrote something. In fact, this was just the kind of push I needed to start working on my novel. That’s really what this is all about, giving writers a reason to start. During my time as an intern, I’ve found that The Writer’s Center jumpstarts many a writing career. TWC instructors work to help their students unleash their creative storytelling potentials. As writer’s, that’s what we need most, people and opportunities to give us a reason to take that first step. It’s productive to obsess about progress and push, push, push ourselves, but it’s also productive to say, “screw it!” and let our writing take its natural course. Whatever NaNoWriMo stage that you’re at right now, be proud of it. Be satisfied, but don’t be complacent. Keep pushing #NaNoWriMo Warriors, you’ve come too far to give up now! We just have to ask—how is NaNoWriMo (National Novel Writing Month) going? Are you making progress? Have you uncovered some hidden gems? Have you encountered some stumbling blocks? Have you awakened a part of your creative genius that you didn’t know existed? NaNoWriMo has a unique effect on all of us. For some, it’s a period of unbridled inspiration when their minds gush with poetic prose. For others, it’s a season of strain and push—an agonizing, uphill climb to get just one good story out. Whatever it is that you’re experiencing during NaNoWriMo 2016, we want you to know that you’re not alone. The Writer’s Center is here to motivate you! To prove our point, we’re sharing these encouraging words from John DeDakis, one of our talented workshop leaders. DeDakis is an acclaimed novelist and author of Fast Track, Bluff, Troubled Water, and Bullet in the Chamber. Building on his experience as a CNN journalist, DeDakis’ novels assume an entertaining journalistic motif as they follow one character, reporter Lark Chadwick, through a maze of conflicts and Fourth Estate adventures. TWC: What inspired the story of your latest novel (and can you share a bit about the novel itself)? JD: The idea for Bullet in the Chamber came to mind in the summer of 2011 when my son died of a heroin overdose. The bullet in a syringe image on the book cover underlines the Russian-roulette power of even one hit of heroin. His fictionalized story is a subplot for my latest Lark Chadwick mystery. In this story, it's Lark's first day as a White House Correspondent for the Associated Press. The Executive Mansion is attacked, the president is missing, the first lady's life is in danger, and Lark's personal life is falling apart when the man she loves disappears. It's a deadline-a-minute thriller about drugs, drones, and journalism. TWC: How do you motivate yourself to keep writing? JD: The motivation is hard-wired into me. I must write. I'm also an excellent procrastinator, but I've built that into my writing routine. When I'm ruminating, I'm still writing because I'm thinking about the story. Eventually—inevitably—procrastination turns into progress at the keyboard. Eventually. TWC: What advice can you share with those participating in NaNoWriMo? JD: Have fun with it. And don't give up. ACTION: Your protagonist is getting money out of the machine when he/she hears a noise from behind. Now set your timer for fifteen minutes and write what happens next. This is the 50/50 method for sparking creative ideas: Fifty settings in which fifty things happen. It helps you get to know your characters and might even spark an entire novel. 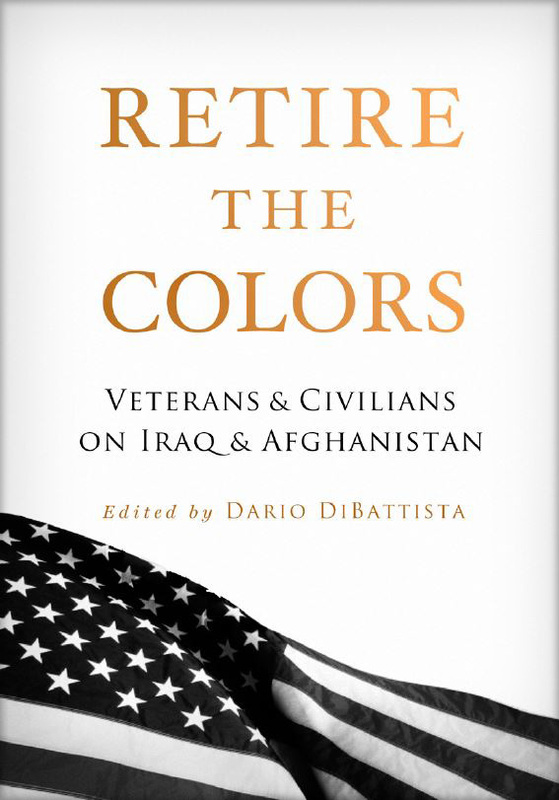 In honor of Veterans Day, Assistant Director Sunil Freeman asks Dario DiBattista about his newly published anthology, Retire the Colors: Veterans & Civilians on Iraq & Afghanistan, a collection of nonfiction accounts about service members returning to civilian life. DiBattista and authors will read from and discuss the anthology 3:00 p.m., Saturday, November 12 at The Writer's Center. SF: First of all, congratulations on publication of this anthology. This includes a wide range of voices about the return to civilian life. It must have been an enormous effort. I’m interested in how this anthology came to exist. Did you propose it to a publisher? DD: Sue Petrie, publisher of Hudson Whitman / Excelsior College Press, did actually come to me with interest about putting together a book. This was my idea—something unique and timely as the wars in Iraq and Afghanistan were "winding down," though obviously we're still involved in combat in both locations. SF: About how many submissions did you receive, and were there any particular surprises? DD: We'd probably gotten about 75–90 in total, though, most of the pieces and writers I'd assigned or personally made come into fruition through my networks. Joseph R. Bawden's "It's Nothing (Singed)," whose piece I was able to select through the open call for submissions through Excelsior College, has stuck at as particularly unique in perspective and really been resonating with general audiences so far. We think about combat stress and PTSD in "a ticking time-bomb" sort of cliché, but for him, he's numb to life in many ways after his time overseas. SF: I’m struck by how many different perspectives you were able to include. Veterans who served in the Army, Marines, Navy, and Air Force are all represented, and we see essays by veterans of both Iraq and Afghanistan. How much shaping of the selections did you do to create the overall collection? DD: A diversity of perspectives was key to this collection. I work really closely with storytellers. Note the word "storytellers." Many of the writers in the collection don't have M.F.A.s or much formal instruction in writing, so I was able to cast a larger net. In a way, I was less concerned with the quality of craft tricks a writer could use for essays in this collection, than helping someone tell a true, honest, impactful story. We collaborate together in shaping their stories, though, of course, many of these essays were completed by very skilled and successful veteran writers who didn't need much editorial direction from me. SF: The inclusion of an essay by the Iraqi Cultural Attaché added another dimension to the anthology. How did this come about? DD: I reached out to both the Iraq and Afghanistan embassies. And even though both were interested, they weren't able to connect me with writer-representatives of their countries. So I asked Dr. Tahani Al-Sandook if she had a piece she'd want to write. And she said yes, obviously. My mentor Mary Collins taught that you will never know what will happen if you don't ask. I was so thankful to have some international perspective, as one of the biggest criticisms of art and storytelling related to these wars is that it's very American-centric. SF: A very small percentage of our overall population has served in the military over these last 15 years, and a large majority of Americans have no real understanding of the military. Essays by civilians who have not served are also included in the collection, creating a sort of bridge over that big divide. Would you like to comment on that? DD: America has an empathy problem, which I think of as a personality disorder. Many of us can't, won't or don't consider the experiences of people who are different than ourselves. Just go to any social media thread or comments section of a controversial story for an example of this. I think this is because we don't read -- reading others’ stories forces us to intellectualize different experiences in a uniquely personal way. It's kind of an ultimate act of communication when you can get someone to sit down and listen to your story, even if it's just a 15-minute personal essay. Hopefully, through this collection, readers will understand the impact of war as being bigger than just the experiences of military men and women. SF: Much of the writing that has come out of the wars after 9/11 has focused on the actual wartime experience. What were some of your thoughts as you put together this anthology, focusing more on the return to civilian life? DD: There are plenty of well-made being "over there" stories, and almost nothing about coming home, which for many of us is an even more challenging coda to our experience. I intentionally made it clear that I was only concerned with stories about "being back home." SF: Could you suggest some authors you’d recommend to anybody who wants to learn more about the experiences of service members who have served in Iraq or Afghanistan? DD: Colin Halloran's memoir-in-verse, Shortly Thereafter, is a tremendously accessible-yet-literary insight onto what combat can do to the soul. Kelly Kennedy takes you over there in a uniquely authoritative way with They Fought for Each Other. Also, oddly, I think Jen Percy's supernatural Demon Camp, about a young man who gets convinced that his PTSD is demonic possession, is maybe the best book I've ever read about Iraq or Afghanistan. SF: Finally, I know you’re involved with many editorial projects, including The Veterans Writing Project journal O-Dark-Thirty, JMWW, .Mic, and 20 Something Magazine. Are there any projects on the horizon you’d like to mention? DD: I've got a screenplay about a Marine coming home from war and his spiritual and physical journey in the form of an epic road-trip with his childhood best friend. Come at me, Hollywood. Dario DiBattista is the editor of the anthology Retire the Colors: Veterans & Civilians on Iraq & Afghanistan. His work has appeared in the Washingtonian, the New York Times, the Washington Post, Connecticut Review, [Pank], Mic.com, and many other publications. Additionally, he's been profiled in the New York Times and has been a commentator on NPR and for the BBC. He served in the United States Marine Corps Reserve from 2001 to 2007, later becoming a distinguished graduate of the Johns Hopkins University M.A. in Writing Program. If you lived in DC during the '70s, you know Cerphe Colwell as one of the most influential DJs in the city's history. Revered by generations and respected by musicians the likes of Tom Waits, Stevie Nicks, and Bruce Springsteen, the man is a legend. TWC is proud to host a reading and book signing of Colwell's new book Cerphe's Up. Free, RSVP required. Tuesday, Nov 15, 7:30 p.m. In conjunction with The Phillips Collection and its exhibition, People on the Move: Beauty and Struggle in Jacob Lawrence's “Migration Series,” The Folger Shakespeare Library presents an evening of poetry that reveals and revels in the history and experiences of African Americans, Tyehimba Jess and Robin Coste Lewis bring their award-winning work to respond to the masterwork of Jacob Lawrence. Tickets: 15; Ticket holders may view the exhibition prior to the reading. P&P is proud to partner with the National Press Club Journalism Institute for a night of pols, pundits, and prose. Come meet fantastic novelists, historians, and cultural critics. Proceeds from this non-profit fundraiser will benefit the SEED foundation, which helps under-served students prepare for college. Tickets: $10 for the public; $5 for P&P members; $5 for NPC members. Pulitzer Prize–winning reporter Steve Twomey takes a fascinating look at the 12 days leading up to the Japanese attack on Pearl Harbor—the warnings, clues, and missteps. Event is free with RSVP.